For top rated termite control in Tempe, trust the exterminators at Varsity Termite & Pest Control. Termites are among the most destructive pests that can infiltrate your home, and without the proper care and vigilance, they can cause immense amounts of damage and compromise the state of your house. At Varsity Termite & Pest Control, we provide free termite inspections to determine the extent of your termite problem and also help to drive these creatures from your property. Reliable and trustworthy, we have an A+ rating with the Better Business Bureau and five star reviews on Google and Yelp! 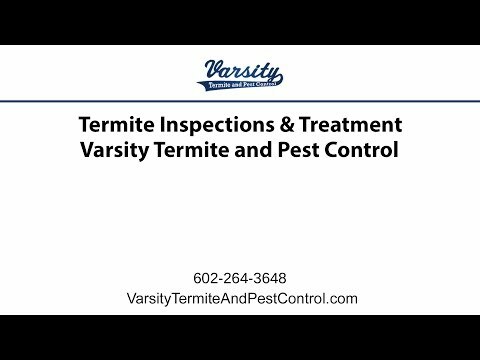 For the best termite treatment in Tempe, contact Varsity Termite & Pest Control today! When you suspect that there are termites in your home, wreaking havoc on the walls, trust the exterminators at Varsity Termite & Pest Control to take care of your termite problem. With a free termite inspection to determine the severity of your termite problem, our dedicated professionals can provide the highest quality Phoenix termite control in the Valley. For top rated termite control in Phoenix, trust the exterminators at Varsity Termite & Pest Control to give you a free termite inspection and help rid your home of your termite problem! To schedule a free termite inspection with Varsity Termite & Pest Control, contact us today. Get thorough and effective termite inspections in tempe with the qualified exterminators at Varsity Termite & Pest Control. When you talk to Varsity Termite & Pest Control in Tempe, we can customize a treatment plan to rid your home of unwanted pests. For top rated scorpion removal services in Tempe, contact the trusted exterminators at Varsity Termite & Pest Control. They say that there are only two kinds of homes in Az., those that have termite problems and those that will. But does your property have to suffer termite damage or be targeted for termite control in Tempe? Tempe homes and businesses are being slowly eaten away by more than just the wind, rain and other elements. Before human settlements arrived in the Phoenix valley and Tempe, there were 1000’s of colonies of termites surviving on the Sonoran Desert floor. Give termites food, a water supply and some juicy wood to eat in a sheltered environment (your home! ), and they’ll swarm. With the influx of the human population, termite infestations in Tempe are commonplace. The 65,000 plus households in Tempe are more than enough food for termites to live off for years. A major calamity can be avoided by getting a termite inspection done by a termite control company in Tempe. Don’t be lulled into a false sense of security, Even though, they’re minute in size, termites can and do cause structural damage. The reason termites can pose such a threat to property is largely due to their dietary habits as well as their social organization. There are thousands of species of termites, and only a tiny percentage of them are considered pests and warrant a call to your local exterminator in Tempe. Ecologically, termites are important for recycling nutrients, creating habitats, forming quality soil, and as a food source for predatory creatures. Termites eat debris and enrich the soil. Termites that build nests near your home, however, are something else entirely. Let’s say your house has no wood or wood products., so why should you worry about termites?} Unfortunately, it’s not that simple. If termites just fed on wood or wood products then termites would not be as big of an issue as they are. It would merely be a matter of reducing wood in building construction. Termites don’t confine their diet to just wood however; they also can eat plastics, paint, and carpeting. While termites may or may not eat each of these materials, they have been proven to take pieces of them to build nests with. The result of termite infestation is ultimately wood damage. Because of their diet, namely wood and wood products, many termite species damage buildings that are unprotected, as well damage or even destroy other wooden structures. Obviously by the time this happens, it’s already too late. It is a far better idea to get on the phone to a termite control service in Tempe and have a termite inspection done to stop the problem literally in its tracks. Because of the level of damage they can cause, termites can be a dangerous and costly pest. For example in India, termites ate the equivalent of roughly four thousand US dollars in April of 2011. Termites generally don’t infest the Arctic, they prefer the same temperate latitudes that we do. Annually, termites cause a lot of damage. As if that weren’t bad enough, they are also major producers of methane, the second most dangerous greenhouse gas next to carbon dioxide. Schedule Your Tempe Termite Inspection Today!